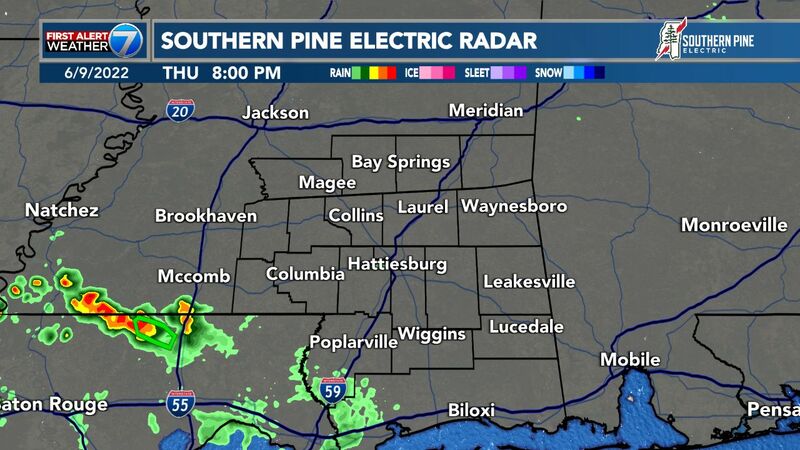 MISSISSIPPI (WLBT) - Damage reports are coming in after severe weather touched down in parts of the state. According to Yazoo Co EMA Director Jack Willingham, one person suffered an injury and has been transported to a local hospital after the home the family was in suffered damage on Cox Ferry Road. Captain Malcolm Robinson of the Flora Fire Department confirms severe weather caused damage there. 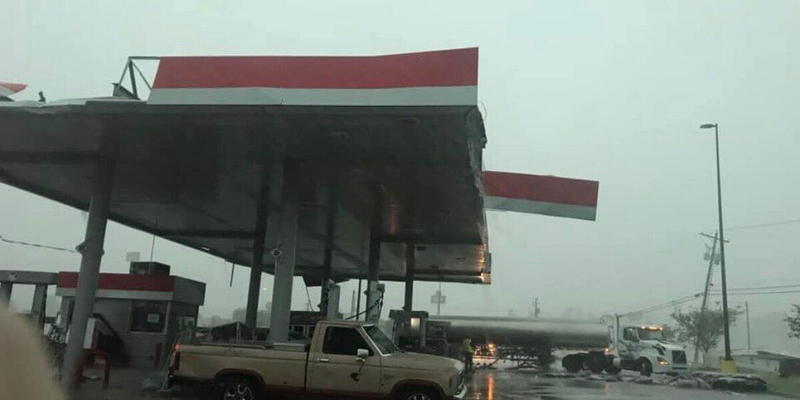 The Chevron gas station on Main St on Old Highway 49 has collapsed a roof onto several cars, damaging them. There are no reports of injuries. Additionally, Capt. Robinson advises that several roads have been blocked off because of trees down across the highways and flooding. In Warren County, Vicksburg Mayor George Flaggs says that numerous businesses have been damaged near at Pemberton Square on Pemberton Boulevard. One person was injured in the city. We are hearing that a woman was pinned under a tree that fell on a house on Westwood Drive in Vicksburg. Cameras captured the moments a funnel cloud hovered over downtown Vicksburg. Two tornadoes have been confirmed in Warren County. The National Weather Service that the damage is associated with two EF-2 tornadoes. One went north of I-20, through portions of the Military Park. This was with 115 mph winds. The second was an EF2 that started near I-20/Hwy 61 and went through the country club in Vicksburg and ended near the Highway 27 south of I-20. This had winds of 120 mph. Warren County EMA Director John Aelfer says that several trees are down near Halls Ferry. A structure fire has also been reported on Cain Ridge Road as well as several trees down in that area. Over 700 are in the dark in Vicksburg and over 6,000 are without power in Warren County. All events in Vicksburg have been canceled for this Saturday. In Rankin County about 130 have taken shelter at the Safe Room. As storms continue we expect more damage to be reported. This is a developing story and subject to change. Good morning everyone! We’re starting off your day a little cool with temps in the upper 50s. 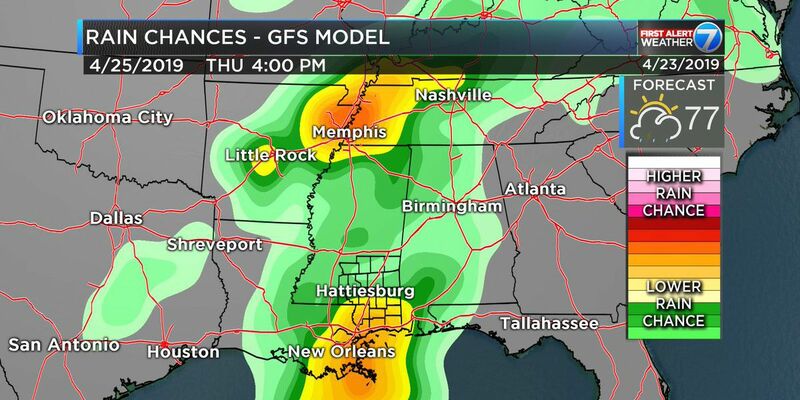 The Storm Prediction Center has most of the Pine Belt under a Marginal Risk for severe weather Thursday.